In celebration of Valentine's Day, here's a look at ten favorite movie romances. Everyone has their favorite romantic classics, from GONE WITH THE WIND (1939) to NOW, VOYAGER (1942) to CASABLANCA (1942). Beyond those familiar films, there are many lesser-known romantic movies which are worth checking out. Below are ten favorite suggestions for perfect Valentine's Day viewing -- although they're great to see any time of the year! Click any of the hyperlinked titles for a more detailed review and information on availability. 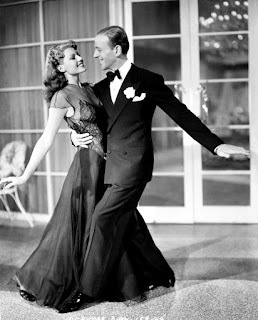 YOU WERE NEVER LOVELIER (1942) - A fun feel-good romance and one of Fred Astaire's most underrated movies; a charming South American fairy tale in which he anonymously courts beautiful Maria (Rita Hayworth) as a favor to her father (Adolph Menjou). But who could avoid falling in love with Rita Hayworth?! The film has a lilting score by Jerome Kern, including "Dearly Beloved" and "I'm Old-Fashioned." Astaire and Hayworth's dance to "I'm Old-Fashioned" is one of my favorite scenes of all time; beautifully shot in black and white, the performers and music epitomize silver screen magic. 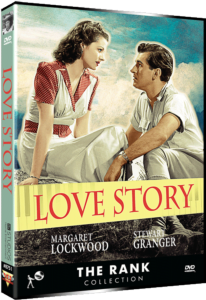 LOVE STORY (1944) - The British film LOVE STORY, sometimes known in the U.S. as A LADY SURRENDERS, is an emotional romance starring Stewart Granger and Margaret Lockwood. Lockwood plays a famous concert pianist who takes a break at a resort in Cornwall after receiving the news that she has a heart condition which is likely to end her life sooner rather than later. She meets devil-may-care Granger but is surprised he seems uninterested in helping the war effort, not knowing Granger is hiding the news that he's a former RAF pilot who expects to go blind due to a war injury. The couple pledge to keep their romance light and just enjoy some time together, but that proves to be difficult given the depth of the feelings they each develop. The movie features Hubert Bath's "Cornish Rhapsody," which was written for the film; you might not recognize the title but chances are that the melody will be familiar. Patricia Roc costars as Kit's childhood friend whose unspoken love for Kit provides another complication. THE CHASE (1946) - This surreal film noir stars Robert Cummings as Chuck, a veteran in need of a job who becomes a chauffeur for Eddie (Steve Cochran), an unscrupulous and rather scary businessman. Chuck soon finds himself falling for Eddie's sad, withdrawn wife Lorna (Michele Morgan). One night, Lorna asks Chuck to help her escape Eddie and flee to Havana. The movie has a dreamlike tropical atmosphere, and the film is surprisingly steamy for 1946. The love scenes show nothing by today's standards, but...wow. When I saw this in a theater, the audience was buzzing about this aspect after the movie! 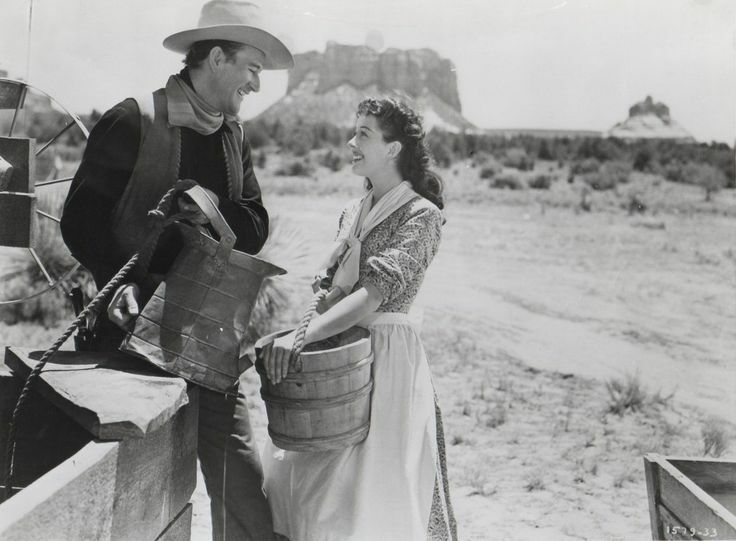 ANGEL AND THE BADMAN (1947) - My favorite John Wayne movie, ahead of several better-known films he made with John Ford, this is a lovely romance about gunfighter Quirt Evans (Wayne) who falls for a sweet but determined young Quaker girl (Gail Russell). Penny is disarmingly honest with Quirt about her feelings for him, and how could he help loving such a kind and beautiful girl? The love of Penny and her family help Quirt put his violent past behind him...he hopes. Wayne's performance is marvelous, as Quirt is baffled by Penny and his growing feelings for her, and Russell is meltingly lovely. This is a special film which deserves to be revisited every few years...and it's a must for those who have never seen it. 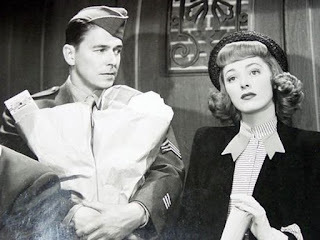 THE VOICE OF THE TURTLE (1947) - A delightfully funny comedy starring Eleanor Parker and Ronald Reagan. Parker plays the ditzy yet charming Sally, who lets a soldier on leave (Reagan) spend the weekend sleeping on her living room sofa. When I was growing up, Reagan's movies were largely absent from TV due to "equal time" regulations, so seeing the former governor and President in this role was a revelation for me. He's winning as Sally's knight in shining armor -- he cooks! he cleans! And he loves Sally despite -- or maybe because of -- her crazy side. Parker is a stitch as a woman who believes her kitchen appliances have feelings. Along with the funnier aspects, this movie has some touching romantic moments, and the viewer may shed a happy tear or two during the moving final scene. KISS OF DEATH (1947) - Film noir fans tend to remember this movie for the electric Oscar-nominated debut of Richard Widmark as gangster Tommy Udo, but what anchors the film is a moving love story between widowed ex-con Nick Bianco (Victor Mature) and his children's former babysitter, Nettie (Coleen Gray). Mature and Gray only have a half-dozen scenes together, but they are deeply touching and beautifully acted. Mature has a world of hurt and love in his soulful eyes, and Gray gives a very natural, emotionally open performance which seems modern. Their farewell at the train station, when Nick sends Nettie away with the children to protect them from Udo, is a heartbreaker. THE HUNTED (1948) - Those who've never thought of Preston Foster as a heartthrob should take a look at this film, a terrific "B" noir costarring the ice skater Belita. She plays Laura, an ex-con sent up the proverbial river by detective Johnny Saxon (Foster). Turns out Johnny and Laura had been in love, but when he believed she was part of a diamond heist he turned her in. They're reunited after she's paroled, and while each is bitter, there is also a palpable longing between them, most notably during a late-night discussion at his apartment just after her release. It's wonderful the Warner Archive has rescued this film from obscurity and made it available in a beautiful print. 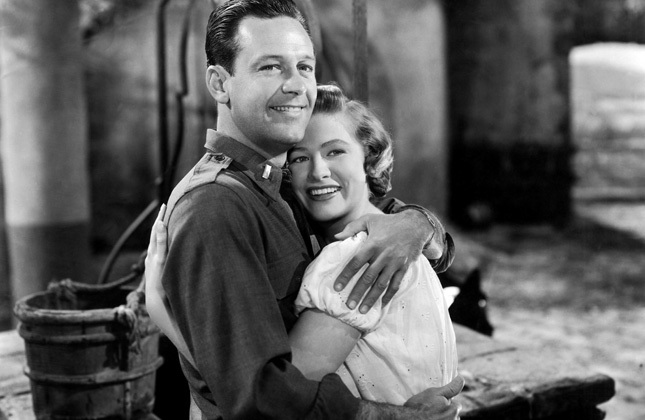 FORCE OF ARMS (1951) - My favorite of the four films costarring William Holden and Nancy Olson. They star as Pete and Ellie, who meet in WWII Italy; he's a battle-weary, stressed-out soldier, and she's a WAC mourning the death of her fiance. They initially bicker, but as Ellie gradually sees past Pete's defenses to the real man underneath, she falls for him, and he can't get the sweet, clear-eyed Ellie off his mind. But he's got to go back to the front. Holden and Olson moved me so deeply I immediately replayed some of their scenes together. I'LL NEVER FORGET YOU (1951) - A haunting time travel fantasy which is a very effective remake of BERKELEY SQUARE (1933). Tyrone Power plays an American in London who goes back to the 1700s, where he falls in love with sweet Ann Blyth. It's soon apparent Power won't be able to stay in the 1700s; can the couple's love span two centuries? The last 20 minutes are quite powerful, with emotional performances by both Power and Blyth. The film's mood is greatly helped by the cinematography; the modern-day sections of the film were shot in black and white, with the time travel sequences filmed in pastel colors. 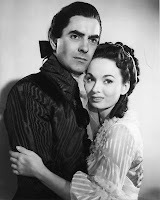 Incidentally, this movie is on a two-film DVD with a very enjoyable Tyrone Power romance in a much lighter vein, LUCK OF THE IRISH (1947) (where the Irish sequences are tinted green!). 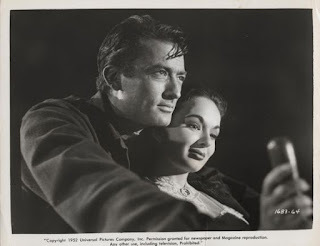 THE WORLD IN HIS ARMS (1952) - Ann Blyth had wonderful luck with her leading men of the '50s, first Tyrone Power and then she starred with Gregory Peck in this swooningly romantic film. He's a sea captain and she's a Russian countess who fall in love, but she's then kidnapped by someone who intends to force her into marriage. (It's a long story!) It's Peck to the rescue, aided by an old buddy (Anthony Quinn). 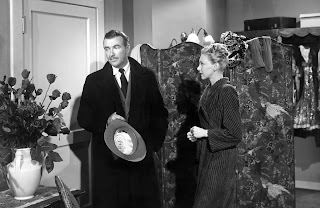 Energetically directed by Raoul Walsh, this is a film which keeps getting better as it goes, and Peck and Blyth have some truly lovely scenes together. 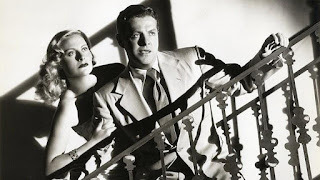 This post is adapted from an article originally published by ClassicFlix in February 2015. I saw The Chase for the first time a few months ago. Surreal is definitely the appropriate description. Love Story sounds wonderful and I plan to follow up on that recommendation. I hope you can see LOVE STORY and enjoy it as much as I did!